Pat Farrell lives in Green Bay, Wisconsin, in the same neighborhood where he grew up. Pat liked to spend time with his father’s friends when he was a boy. His dad’s friends were woodworkers and hunters in the area’s sloughs and marshes. They taught him how to make equipment for hunting water fowl like decoys, ammo boxes, canoe paddles, and push poles. Pat made his first decoy when he was just 11 years old! Pat kept pursuing his interest in waterfowling equipment after he grew up. He taught himself more and more complicated skills over the years. He worked as a pipe fitter during the day, and made waterfowling equipment in his spare time. Can you think how Pat’s professional work connected to his recreational work? Pipe fitters install and repair pipe systems. Good pipe fitters pay careful attention to details, use math to solve problems, and make judgments based on observations. A good boat builder uses these same skills! One important type of waterfowling equipment is skiffs. One of Pat’s favorite activities is taking apart and rebuilding older skiffs. 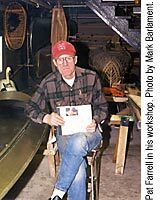 When he was 40 years old, Pat made his first hunting skiff. Skiffs are a traditional kind of boat, but Pat makes them unique. He creates special designs and does very high quality work. Today, Pat is one of the only people in Green Bay who still makes skiffs. Pat is a master at making equipment for waterfowling and he likes to make other things too. “I like to work on a boat, then build a clock, then build a piece of fancy furniture, then go back to a canoe or a skiff or a paddle.” Pat’s even made a 4-foot tall rabbit. He also likes to train hounds to use for hunting.